So, what about the children? Many marriages result in children, and when a separation occurs, there must be a way for the children’s needs to be maintained. This often results in the payment of child support from one spouse to another. 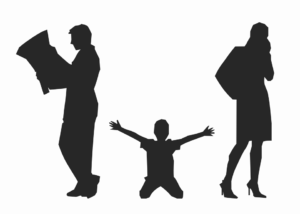 How much child support is paid often depends on several factors including: the custody arrangement that is in place (50-50 custody or primary custody with one parent), the gross monthly incomes of both parties, pre-existing support for other biological children, health insurance premium costs, and work-related child care costs. Using these numbers, Spouse B would pay monthly child support to Spouse A in the amount of $1,406.00 under Worksheet A. For more on child support, check out next week’s blog!